The Gunillaberg estate was built in the late 17th century by Johan Printz, who named the manor house after his mother Gunilla. He went on to become the third governor of New Sweden, the Swedish colony in that is now the state of Delaware in the USA. While driving back to Stockholm from the west coast of Sweden, I realized that we'd be passing Tage Andersen's Gunillaberg in Bottnaryd, just before the city of Jönköping. Despite the long drive home, we decided to drop by to see if we could get an early lunch at Tage's café, and of course, to see his creations "live" for the first time. Now, there can't be many "garden people" in Sweden who don't know about Tage and his work, but for those who do not, he is a real renaissance man form Denmark. Originally trained as a pastry chef, he has diversified his artistic portfolio to include flower arrangements, furniture, sculpture and other art installations. He's even published several books about his work and thoughts, and is the proprietor of a floral boutique with a museum in Copenhagen. In Sweden, he managed the well-known gardens by Rudolph Abelin at Norrviken in Båstad for a couple of years. Tage Andersen bought Gunillaberg in 2008, and has since transformed this late 17th century manor and its gardens into a distinctively Tage-style gesamtkunstwerk. Despite being a Renaissance man in sprit, Baroque is definitely more his style - down to the artistic, old-fashioned clothes he carries (of course I shouldn't comment on looks, but he looks a little like a mixture of Rembrandt and a mystical spirit from the forests - in the most positive way). And his artworks and installations - dramatic, twisted, voluptuous, always with a personal touch to them. While strolling through the house and gardens, it felt like everything there was touched by a magic wand, and turned into something that was "more" than it should have been - a bit magical, and definitely Tage-like. One of a kind, he really is. While I really wanted to have a chat with Tage, he seemed a little bit stressed and was really busy with serving lunch to the unexpectedly many guests - something that the very friendly young lady at the café mentioned while doing exactly the same. So we ate our delicious white borscht-like soups and finished with coffees and Tage's specialty, "karamelkrans" (caramel covered flaky round pastry - extremely sweet and tasty), completely happy with having just added another 1.5 hours to our already long journey back to Stockholm. One of the outbuildings, now with a shop that sells a small selection of Tage's artwork and books. Ceramics with forms reminding of flower bulbs, surrounded by large flower containers on rusty platforms - Tage often uses rusty steel as material in his works. Large containers with Agapanthus and Camellias on the backside of the manor house. Tage arranges art exhibitions inside the house - and even the floor is painted in a voluptuous pattern, like Baroque gone crazy... (while it still manages to be in harmony with its surroundings!). A fanciful bosquet made of rusty steel and covered with passifloras - there are two of them, the other can be seen behind the square pool. They magically transport you to the gardens of Renaissance and Baroque, while still being surrounded by the dark Swedish forests. Pathways with artwork - and even the larches looked like they could come alive in the dusk of Swedish summer nights. A large green house is used for concerts. The scene inside the green house - what a lovely experience it would be to come here for a concert... Maybe next summer. Even the chicken coops were fancifully artistic - and very rusty. And one last wink before leaving - even the entrance is a lovely combination of strictly formal and wonderfully twisted. The little Gunnebo Castle called, again - its powers of seduction (not least in form of delicious lunches served in the kitchen garden....) are still quite potent, it seems. As I've written earlier, the little castle of Gunnebo together with its gardens really is a love story gone awfully wrong. Like a greedy mistress, it seduced and held its masters captured until all their means were exhausted, eventually driving them to bankruptcy and destitution. The story is touching - who doesn't love a dose of true madness? - and the buildings and gardens are a perfect example of late 18th century architecture inspired the Palladian villas of Italy and gardens of Louis XIV in France. A real pearl, and an escapist dream inspired by the southern latitudes of Europe, landed amongst the northern forests and shores of Sweden. For the whole tragic story of Gunnebo, see my earlier post here. An 18th century drawing of Gunnebo; the orangerie on the right is under reconstruction for the moment; it will probably be completed next year. Sculptures still surround the pool seen in the pictures above. Cows lazily grazing just south from the fountain pool. An unusual view towards the building from a little hill by the "castle" - that really is too small to be called so. The kitchen gardens (in opposite direction from the hill where I took the previous photo). I do love the kitchen gardens - so beautifully composed. The handsome orangerie/green house again... I wrote about it even in my earlier Gunnebo post. "Advanced horticultural science" - they still train the apples on trellises attached to the walls of the kitchen garden. Look at all the pears! And back to the castle - it was lovely to stand in the shade under the main terrace (which you can see from the garden in the first picture). And a final view from the terrace, with the fountain forming the focus of the central axis - Gunnebo is such a delightful little example of 17th/18th century European garden design, in the middle of the forests of southern Sweden. Small ravines between the cliffs, with pink flowers forming like a stream towards the sea. Located on a small island on the west coast of Sweden, the tiny city of Marstrand comes alive in the summer when white-sailed boats arrive like huge migratory birds, with their crews filling the cafés and streets with their excited busyness while waiting for the next race. I'm not into any kind of sail racing, so I kept away from the crowds and just enjoyed a windy walk along the grey, smooth cliffs of the island. Afterwards, a coffee at the huge Carlsten Fortress, and I felt like a winner anyway. An unreal sight - pink waterlilies in a small, dark pool between the cliffs; can they be natural, or did someone plant them here? Stone walls of the Carlsten Fortress, built in the 17th century on the highest point of the small island. An abundant crop of gooseberries and red currants. 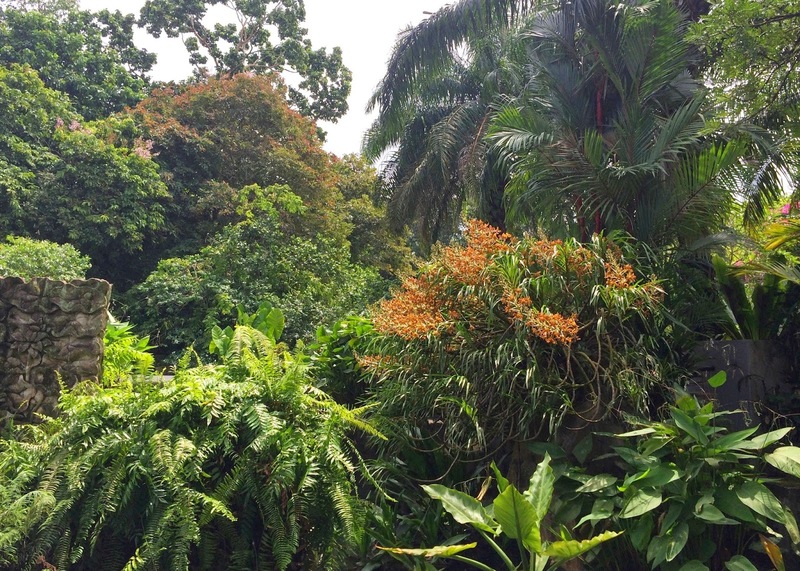 Back in Singapore, we got a roaming welcome from the largest orchid in the world, the Tiger orchid. In full bloom only once in every 20 years, it is for the moment putting up a huge show at the Singapore Botanic Gardens. If you are around, try not to miss it: 35 long stems are carrying over 50 flowers each, which means that more than 1750 large and fragrant orchid flowers are swaying in the wind close to the Tanglin gate of the gardens! 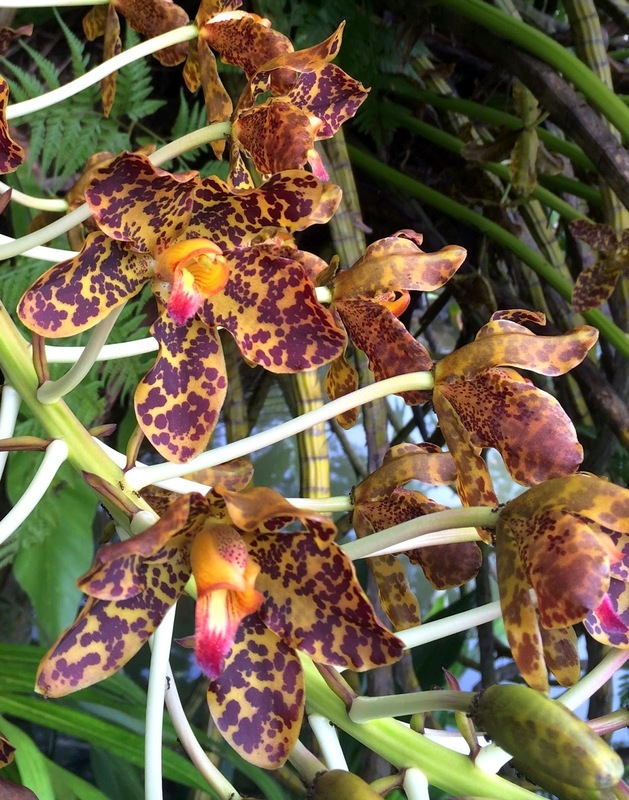 The Tiger orchid (Grammatophyllum speciosum) is named as the markings on the flowers are thought to resemble the stripes of a tiger (leopards are not native to these areas, if you think that it would make more sense). A real heavyweight of orchids (or any other flowers), a mature plant can actually weight more than one ton (! ), so it usually grows at the "fork" of the lower tree branches - higher up, it would probably take down the whole tree, or at least the branch is was growing on. This huge, fragrant orchid is native to Singapore, but has unfortunately been extinct in the wild since about year 1900. The National Parks organization has made conservation efforts to reintroduce the plant on the island, and has luckily had some success even in the city center close to Orchard and Alexandra Roads, and more expectedly, in some remote parks (of course, nothing is really remote in little Singapore...). As I said, try make an effort to see it if you are around; it is quite special to see the largest orchid of the world in full bloom! River Aura runs through my hometown Turku, an old trading town since early 13th century and until 1827, the capital of Finland. The handsome Turku Cathedral, seen in the background, was consecrated in year 1300. The huge ducks in the river are a permanent art installation. We are just back from a couple of weeks in Sweden and Finland, happy to be back home in Singapore but already missing our loved ones. Some years, I'm not sure if I want to go to Scandinavia as I know how hard it will be to leave, even if I really love our life in Singapore - a somewhat schizophrenic feeling that seems to grow each year that goes (we are now into our 7th year away from Saltsjöbaden...). While in Turku (or Åbo, as it is called in Swedish), my Finnish hometown that I left for almost 23 years ago, I realized all too late that I've never really photographed it like I should. Of course, this epiphany came on my last morning there so not much was to be done, but I nevertheless lugged my camera along on our morning walk along Aura river that runs through the city. We were a bit too late, the sun was already too high up at 8 am making the photos look a bit harsh, but I wanted to include this ramble amongst my posts anyway. As it was an early morning in late July, most people were on holidays, and the sleepy little city was just waking up to yet another unusually hot summer day. After wandering along the river, we had a freshly brewed morning coffee at one of the many cafes under the old linden trees. Absolutely lovely, both the walk and the coffee. The archbishop's residence behind the Cathedral - with the Aura river running just behind, not a bad place to live... Edited: I've obviously been away long enough to forget some details... This building is not the archbishop's residence (which is situated in the next block), but a building belonging to Åbo Akademi, the only exclusively Swedish language university in Finland. The Brinkkala Building, scene for an important tradition in Turku and in the whole Finland: the Declaration of Christmas Peace, which started in the 1320s (and in this actual place since 1888). The tradition is said to been interrupted only during the Russian invasion and occupation of Finland in 1712–1721, in 1917 when the militia was on strike, and in 1939 because of a fear of air raids. The Declaration of Christmas Peace launches the Christmas celebrations and in a way marks the official start of Christmas in Finland. At noon on Christmas Eve, the declaration is read out loud (and broadcasted on radio, TV and today even on YouTube) to remind people that Christmas peace has begun, to advise people to spend the festive period in harmony, to threaten offenders with harsh punishments, and to wish all a merry Christmas. Standing here in the cold Christmas weather, listening to the ancient message with family and friends, and afterwards, having a hot glögg (kind of gluhwein) is one (in my humble opinion) of the best ways to start the Christmas celebrations. Pinella, an old restaurant across the park from the Brinkkala Building - sleeping through the early summer morning. The Turku city library was built in 1903 with the Stockholm House of Nobles (Riddarhuset) as a model (what a crazy idea, really). Another café, in another old house... Artek, one of my favorite shops in Finland, used to be here earlier. Entrance to Café Quensel, behind the Quensel house built in year 1700. It had a pharmacy by the riverside, which is now a charming museum (the red color looks much more vivid here than in real life). Inside the courtyard of Quensel house; courtyards like this are typical for the old wooden houses in Turku. Under one of the many bridges in Turku - when I grew up, the riversides were filled with small boats ready to take off to the archipelago; now, sadly only very few keep their boats there because of all vandalism (instead, there are many boat and yacht clubs a bit further from the city). Föri, the famous ferry of Turku (well, famous at least in Turku...). Authorities have tried to close it several times, but never succeeded as it has something of a cult following in the town. Mid-July rush-hour traffic in Turku. A further view towards the mouth of river Aura - at least the guest harbor is busy and full of boat people on holidays. One last glimpse from the river mouth towards the Turku Cathedral, before turning back for one of the cafés under the linden trees close to the library. 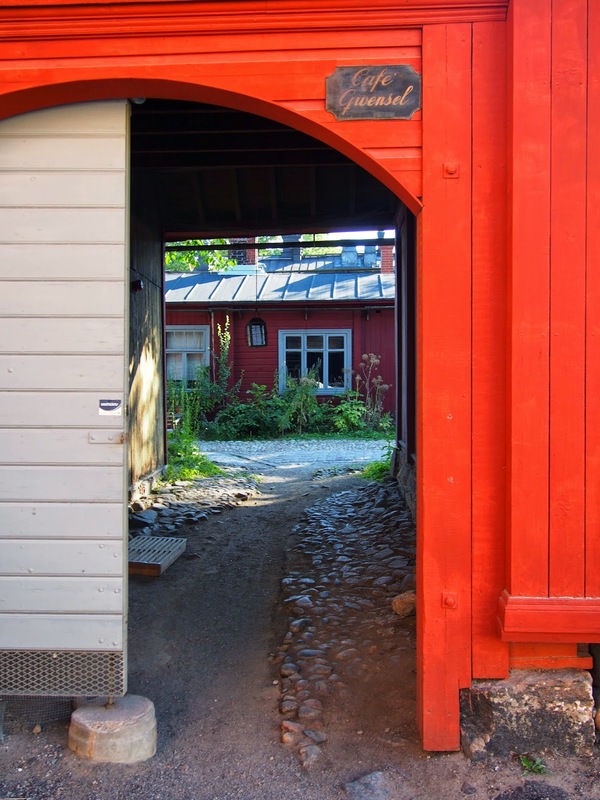 For more posts from Turku and areas nearby, do click "Finland" in the Label-section.